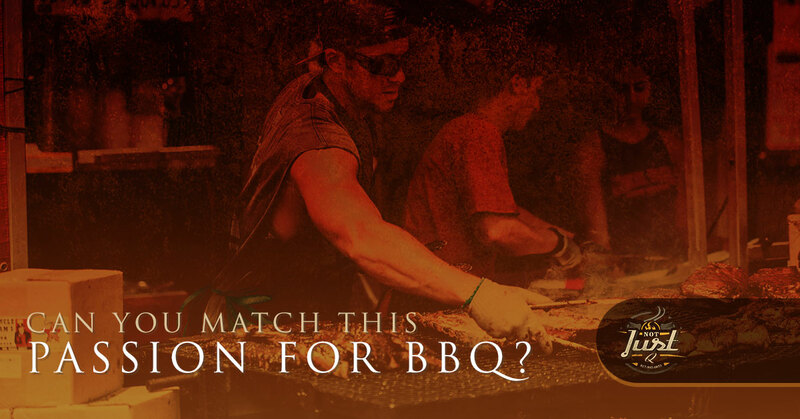 Can You Match This Passion For BBQ? We all have a passion. Some people are passionate about sports, as Texans, we will support our sports teams until our last breath. Some people are passionate about their hobbies – who doesn’t love a good scrapbooking afternoon? And others are passionate about food. At Not Just Q, we’re happy to say that we fit into this last group, but we take it a step further; we are passionate about sustenance. Specifically, we’re passionate about BBQ. Delicious, fall off the bone, mouthwatering BBQ, is our focus always will be. How we came to be this way we don’t know… Perhaps it was our mama’s tasty cooking. Maybe it was how obsessed everyone seems to be about BBQ down in the south. Or possibly it was the simple fact that we were born to be passionate about BBQ. Not Just Q is built on a desire to share our passion for BBQ with others through our catering service; however, we want to explain to you about how deep our passion for BBQ truly goes. If you’re like us and have a heartfelt love for BBQ, then consider us the next time you have a special event. Everyone has to have something that gets them through those long, miserable weekdays. BBQ is what drives us to be a better, stronger chef. At Not Just Q, we’re not your average type of BBQ. We don’t use generic sauces that are too bitter or too sweet to truly be tasty. We don’t use meat that’s anything less than delicious and nutritious. We’re not a restaurant or a fast food restaurant. We are a catering service that offers authentic, smoked meats that will fill your mouth with water at the mere smell. We strive to set ourselves apart from other BBQ companies in Dallas because we know that we’re a unique food truck and catering company. We have a passion for BBQ that other companies can only pretend to have. This passion within us for BBQ is driven by the desire to serve our fellow Texans the food they want to fill their belly’s with. We serve BBQ that’s bold, flavorful, and genuinely a representation of Texas. Without our passion for BBQ, we wouldn’t be able to deliver on our promise of savory meats and homemade sides. The passion we have is linked to our desire to serve our fellow Texans a hearty, filling, and mind-blowing variety of flavors of BBQ. Whether or not you’re a true Texan, you’ve probably had BBQ once or twice in your lifetime. You’ve probably even had it once or twice in the last few months. As a Texan, you probably know that there’s a variety of BBQ out there all through the south. From Georgia all the way down home in the Lone Star State, there are an array of different types of BBQ. Based on the region of Texas you’re in, you could have a different style of BBQ. There is ‘cowboy style’ BBQ, and in the Texas Panhandle, you’ll have onion rings or apricot puree served up with your BBQ. We’ll dive deeper into the different styles of regional BBQ later, but what you should take away is the simple fact that as a Texan, BBQ is in our blood. As a passionate company about BBQ, we strive to individualize our food truck and catering company from other similar sustenance businesses. Unlike other BBQ companies, we create pull-apart brisket and fall-off-the-bone, BBQ slathered pork. Our perfectly grilled chicken won’t be dried out or under sauced. We make sure to continue to have juicy, grilled chicken that is sauce-slathered, so you’re feeling full and satisfied as you lick your fingers at the end of your meal. When it comes to the pork, we create our own BBQ sauce to put on it. Now, we can’t give you the details, but we can tell you that it’s homemade with just the right amount of ingredients that’ll convince you to lick the plate. Our sides of Mexican slaw, cheese corn, potato salad, garlic green beans, and smoked pit beans are original as well and we add a little Southwest feel to our cooking with our selection of tacos. From catered dinner parties to business meetings, you’ll have a grand old time enjoying our BBQ. If you have a passion for BBQ, then we’ll deliver you the best BBQ to continue to fire up your ardor when you decide on our catering company the next time you have a special event.